Max is from our only Gypsy and Char breeding. We were very excited about this cross and were so happy with the results that we kept a male back for our own breeding program. His dam's sire, grandsire, and full-siblings have all held places as the top working Aussie in the nation through the ASCA stock dog trialing program during the past two decades. 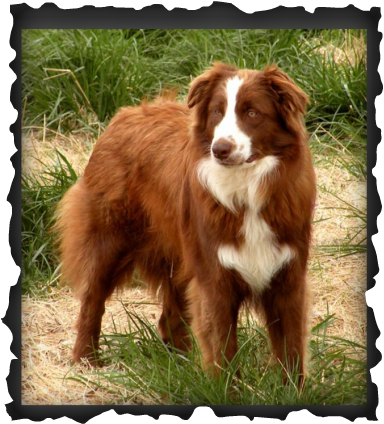 Max's sire is a classic example of Slash V breeding - he was an old-style working farm dog with a definite on-off switch. His sire specialized in keeping the animals calm and under control while reading Rose Marie's mind about what needed moved next. The strongest asset in a Slash V breeding has always been the dogs' performance on the farm, but its worth noting that very close relatives to Max's sire have ranked top in the nation in stock dog and agility venues in recent years. As a puppy, Max was always very quick to pay attention to “you” over the other dogs around him. He found a way of sneaking out of his playpen as young as three weeks without making so much as a sound, and you would glance down and see him sleeping on the floor beside you. He was seldom fussy as a youngster, but always found a way to quietly sneak into your path and heart. He was the biggest pup in the litter, but even so he isn't any larger than Char as a fully developed adult. The picture above was taken Easter Sunday 2010 so he was still shy of a year. As an adolescent, he was one of the most obedient dogs we have owned when given a clear command. However, when not following clear orders, he tends to charge first and think later in basic activities. He is more reserved around strangers than his mother or the other puppies in the litter as they matured. He is a powerfully made boy and really gorgeous to look at. We haven't had a chance to work him on stock much due to the repairs on our house, but we hope to work with him more soon. His first pups have all had rave reviews from their owners. All the pups that we have had feedback on started working stock by the time they were six months and are sharp as tacks. One pup has decided his job is to round up his owners chickens and brings them away from the dirt road every time the neighbors drive by. (Obviously, chickens shouldn't be close to dirt roads). Max tested Normal/Normal. i.e. not a carrier, for the following mutations MDR1 (Ivermectin Sensitivity), Collie Eye Anomaly, Cone Degeneration, Canine Multifocal Retinopathy 1, Degenerative Myelopathy, HSF-4 Hereditary Cataracts, Hyperuricosuria, Neuronal ceroid lipofuscinosis 6, and Progressive rod-cone degeneration.